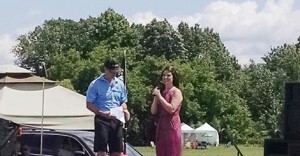 Emcee Trevor Brooks with Livingston Senstion winner Sarah Brown at the Michigan Challenge Balloonfest on Sunday, June 28, 2015. 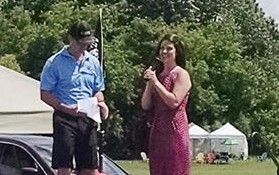 Howell Township resident Sarah Brown was selected as the Livingston Sensation winner during the singing competition held at the Michigan Challenge Balloonfest on Sunday, June 28. Brown sang “Natural Woman” and competed against eight other contestants who were judged on tonal quality, presentation and song selection. Her prize was a hot-air balloon ride from local pilot Denny McGuire. Brown is married and has a 3-year-old daughter named Abigail. In addition, she is an active member of Howell First United Methodist Church and sings with the praise band. 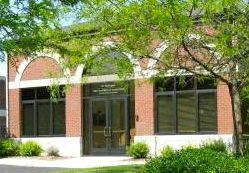 Brown has also been in various productions at The Community Theater of Howell as well as The Dio Theatre in Pinckney. She studied musical theater and opera at Oklahoma City University. “The best part of the competition was that after they announced my name as the winner, Abigail grabbed my neck, gave me the tightest hug and said ‘you won, mom, you won’. It was so touching to see how proud of me she was. Most importantly, I want to thank God for giving me this talent. I don’t know where I would be today if music wasn’t a part of my life,” said Brown. The Michigan Challenge Balloonfest is the state championship of hot-air ballooning, and is hosted by the Howell Area Chamber of Commerce. Major sponsor is Lake Trust Credit Union.